It’s morning. You’re pouring milk over your cereal and a thick glob lands on your cornflakes as you tip the carton. What do you do? These days most people don’t expect to find cream in their milk, so many think this yellow blob mean it’s gone off. Homogenised milk is the norm today, and the cream line is an endangered beast. Homogenisation is a mechanical process which breaks up the cream’s fat globules so they don’t float to the top, and distributes them throughout the liquid. There are several reasons behind this; it increases the whiteness of milk and stops ‘unsightly’ cream streaking, it reduces its fatty sensation, which large-scale processors believe consumers don’t want, and creates a uniform consistency, crucial when processing milk in huge volumes. We don’t homogenise at the Riverford Dairy as we feel it’s unnecessary, adding to the carbon footprint of the product, purely for cosmetic reasons. Our philosophy of keeping things simple applies here and anecdotal evidence suggests it’s a big factor in our milk’s popularity; it means it’s got personality. Mass-produced milk travels from many farms and is standardised at enormous processing plants before bottling, so there’s no difference month to month. Riverford milk only comes from our herd (though occasionally we have to top it up a bit), so its flavour and colour reflect what’s going on in the farming year – and the milking parlour is 200 yards from the dairy. Come springtime when the cows go out their milk is lighter at first, then becomes richer and more yellow as new grasses and clovers come through. In the winter they eat mainly silage and hay, so the milk changes again. Our cows also get what doesn’t fill your veg boxes (nicked spuds, dented apples) which we think adds to their milk’s deep flavour. Some people believe that unhomogenised milk is better for you too, linking it to a lower risk of heart attacks – however not all scientists agree on this. It’s probably best to stick to the old adage that nature knows best. We don’t mess with your milk, we just pasteurise and pack it, so enjoy your pint of personality. Though technically it’s 568ml – it just doesn’t sound as romantic. Homogenisation – what do you think? Homogenisation is a mechanical process which breaks up the fat globules of cream in whole and semi-skimmed milk, and distributes them throughout the liquid so that they do not float to the top. Basically it gets rid of the cream layer. There are a number of reasons why this is done; it is said to reduce the ‘fatty sensation’ of whole milk, which producers believe consumers do not want; it increases the whiteness of the milk, making it more appealing to customers (when sold in transparent bottles), but most of all it creates a liquid of uniform consistency, avoiding the development of a cream plug which can cause problems when processing milk on huge scales. We have an interesting situation here at Riverford because at our Devon dairy we don’t homogenise. We like to give people the option of giving the carton a shake if they want the cream mixed through the milk, or to have a nice glob of cream on their cereal if they so fancy. Meanwhile a survey sent out by Acorn Dairy, our organic milk producer in North-East England came back saying the majority of their customers wanted homogenised milk as they think it tastes better in tea. Which do you prefer? 1.It tastes great. Maybe that’s because it is fresher; we go for a seven day shelf life compared to big dairies’ 14. 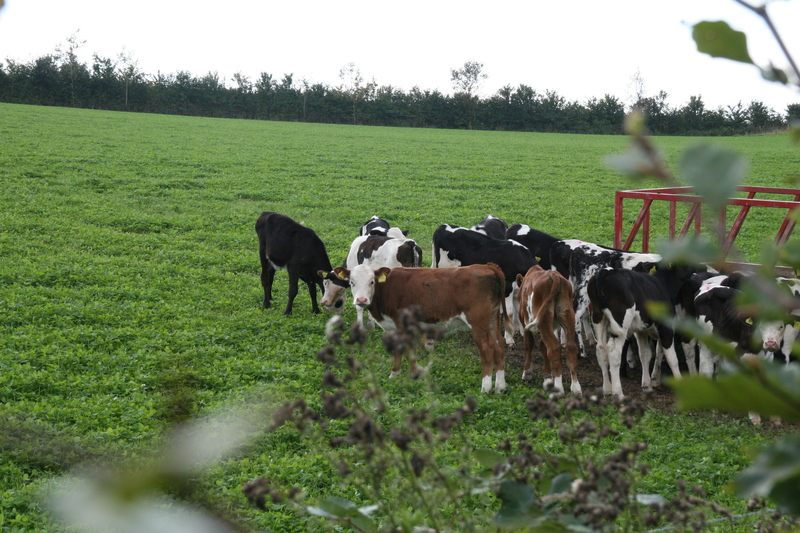 Maybe it is that the cows have a more natural diet of forage (grass, clover etc. ), not grain and soya. You can taste a cow’s diet in the milk, as we discovered recently when the cows ate waste apple pulp during cider making season. Not everyone liked it. 2.It’s better for you. Cows that eat more forage have substantially higher levels of Omega 3 in their milk. Most milk is homogenised to break up fat globules to nano-sized particles and stop them from separating out. There is some evidence that these can be absorbed into the blood directly across the gut wall, with potential health implications. We don’t homogenise, leaving you to decide if you want to give the milk a shake or not. 3.It is better for the cows. Our cows suffer less mastitis, less lameness, less infertility and live for much longer. Some super-intensive herds get fewer than two lactations per cow; the average is perhaps three or four. We get five. 4.It’s better for the environment. Our pastures get no synthetic fertilisers or sprays and are seldom ploughed, resulting in more biodiversity, lower use of fossil fuels and carbon dioxide being sequestrated in soil organic matter. 5.You know where it comes from. The milk is all from our cows, 200 yards from the dairy and delivered straight to your doorstep, without being transported unnecessarily or mixed with milk from hundreds of different farms. 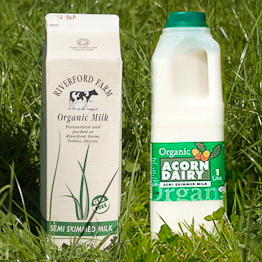 We took a trip to the Riverford Dairy, a couple of miles from our farm in Devon. The dairy, owned by Oliver Watson, Guy’s brother, has just 8 staff members and 250 cows, but supplies us with a lot of organic milk, yoghurt, cream and butter. Riverford cows are a mixed breed of European hill farm herds. Each cow produces around 18 litres of milk per day and lives for 6-8 years (higher yield cows live 2-3 years). They live outside for 9 months and stay in a barn over winter. In the barn, the cows have their own stalls so they can sleep without being in the way of the rest of the herd, but they are free to walk around. They are fed silage (fermented grass), vegetables, fruit and cow cakes (made from maize, barley, wheat and pulses). Milking happens daily between 4:00-5:30pm and takes 2-3 minutes per cow. Milk from the Riverford dairy is pasteurised to kill off bacteria but isn’t homogenised, so before opening one of our cartons, give it a good shake.